18th century shipmates plaiting each other's queues. Hair. We want it; we don’t want it. We try to grow it; we try to remove it. It is despised; it is sacred. It is our ‘look’, though we cannot ever actually see most of our own. But this paradox is an old one. We have been fussing with our hair for centuries. 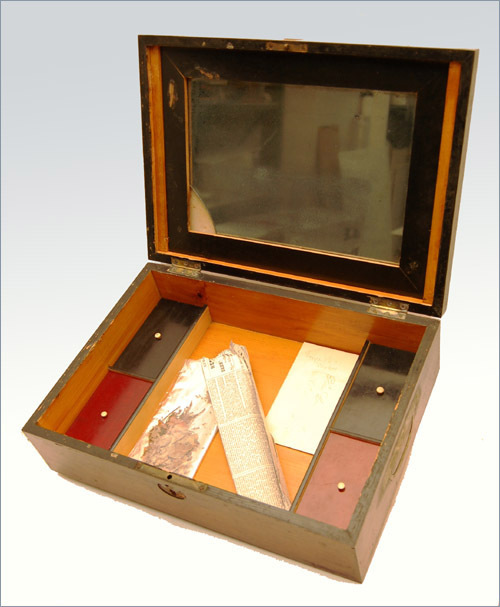 At left is a lock of James’ hair, dated from the day of his death in July, 1882. 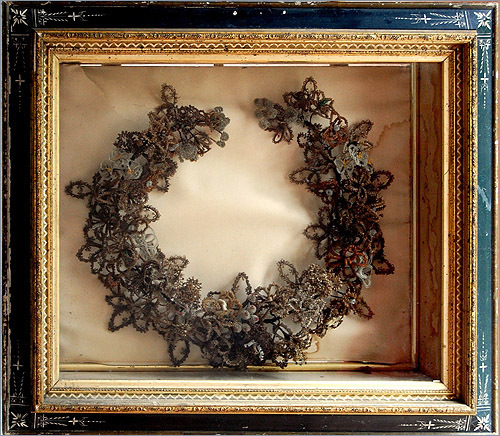 At right is a plaited brunette ringlet of Eliza J. Drummond’s hair, James' wife, dated from the day of her death, Oct. 27, 1851, age 42. She did not live long enough to acquire any gray hairs, despite misfortune. The Drummonds would lose their first three children in infancy, starting in 1842. Not until 1851 would survivor Lizzie arrive. Eliza was age 42; she died three months later. The Captain sailed on until 1882, never re-marrying. They all lie just off the Parker Head Road, behind the split granite fence of the Drummond plot in Phippsburg. Curiously, also in the desk is a hank of Capt. 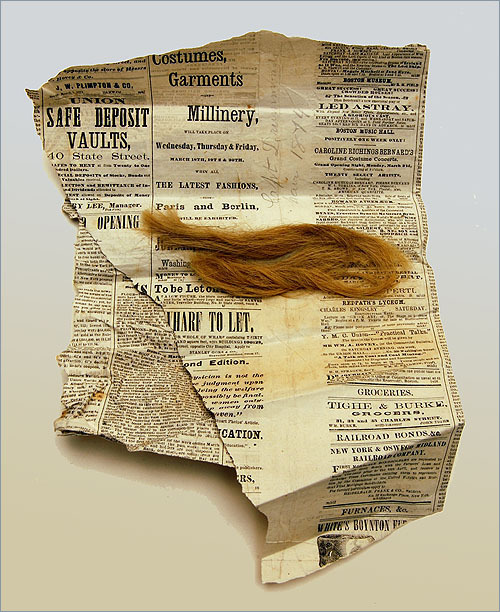 Drummond’s hair, folded into a torn fragment of the Boston Post of March, 1874, certainly well before his death eight years later with considerably whiter hair. 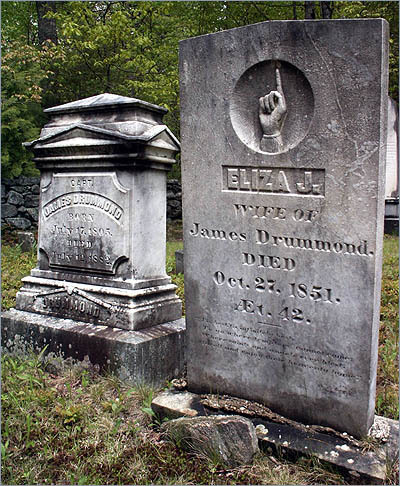 In 1881, the year before he died, his namesake ship, the JAMES DRUMMOND, was launched from the Minott yard in Phippsburg, where he had long been a financial partner. This event was undoubtedly some, at least ceremonial, consolation for the uncertainties of investing in ships, which were enough to turn anyone’s hair. 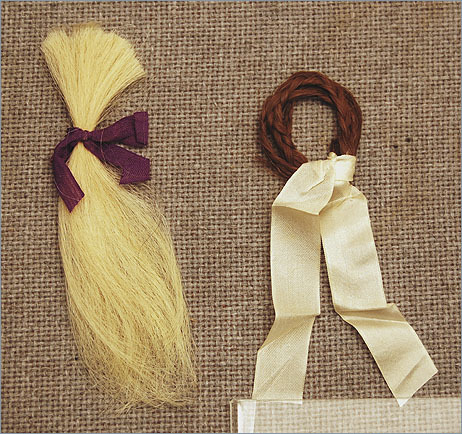 Two brooches made from human hair, a fairly common 19th century pastime. (The squares are inches.) (left) From Olive Titcomb Pote, wife of Capt. Samuel Pote of Freeport (see her locket with hair strap, 'Notes from the Orlop, No. 25'); (right) From the family of Capt. E. L. Carter of Woolwich. 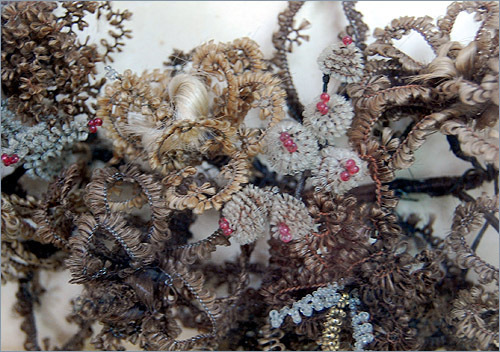 The powerful associations conveyed by hair were not confined to mourning; such brooches were exchanged between friends as tokens of living remembrance as well. 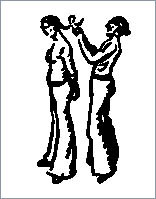 Hair for women historically has generally meant hair grown long. 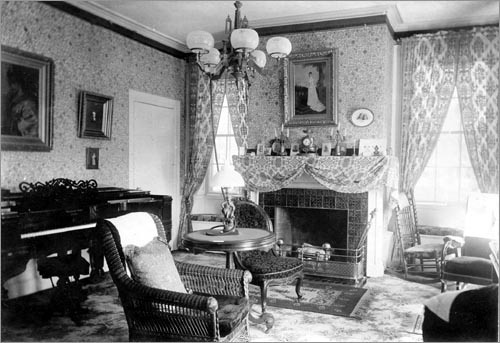 Paradoxically, long hair was in the way for most work required of women, without numerous techniques and devices for keeping those strands away from the cooking fire, the wash water, the lamp wick, the baking flour, the laundry mangle, the diapers, and the yanking paws of Best Beloved. Whether for work-a-day or more formal occasions, large tortoise-shell combs like those above were handed on between generations, imbued with a deep personal connection to the previous owner. We have become so used to similar looking plastic products that the worth of hand-sawn, hand-filed, hand-polished heirloom tortoise shell combs is lost on us; we don’t even know what it is that is being imitated. 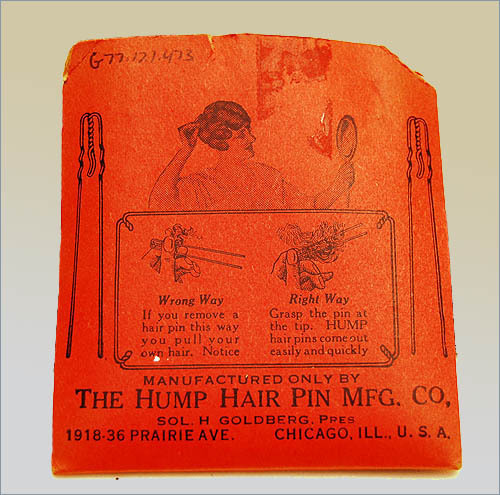 (above center) Patent hair pins had come into play by 1900, and, like most new technologies, required written instructions (below). 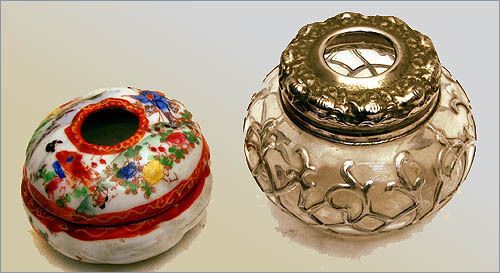 Hair receivers (above) have finally disappeared from dresser tops, but these containers with the round hole in the lid were a common Victorian fixture. 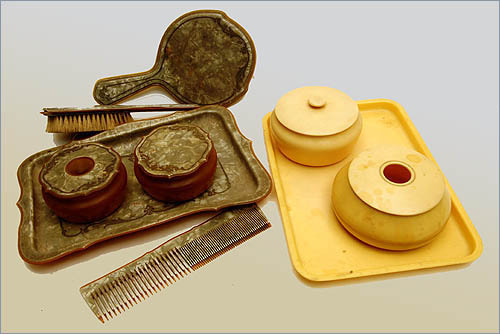 Combed-out hairs were kept for both stuffing pincushions (hair oils lubricated the pins), or for fabricating supplemental hair pieces (ratts) that enhanced the ‘big hair’ effect. 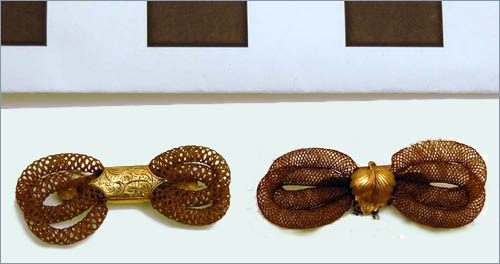 Two vanity ensembles in ‘modern’ materials that included hair receivers. (at right) “Ivoroyd” or “compressed ivory” was patented in 1855. (at left) A ca. 1920 Dupont product called shell Pyralin used a suspension of fish scale iridescence; it has since become affectionately known as ‘Mother-of-toilet seat’. 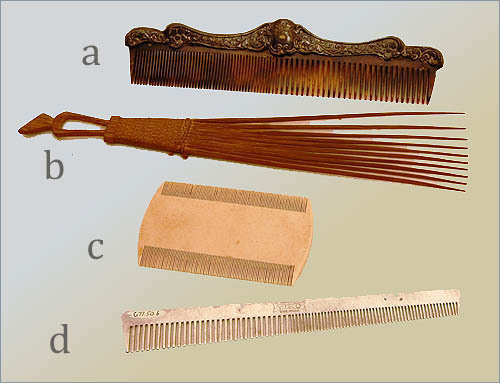 Three new-comers and a foreigner: the many fine teeth required by combs were always problematical to make. New materials drastically improved the design and longevity. C. A double-edged lice comb, stamped “Tortoloid” (I’m not making this up), another early plastic. D. A “Viko” brand aluminum version, of somewhat timeless provenance in that aluminum has proved to be the final solution; lightweight, unbreakable, (and excellent heat conductors for serious ‘do’ construction), such combs flash in the hands of hair professionals everywhere. The world didn’t know what to make of this strange shiny light metal, even after the secret to its cheap refinement was discovered in 1886. Apparently inspired by the novelty of German aluminum combs viewed at the 1893 Chicago Columbian Exposition, two Wisconsin fabricators of early aluminum cookware and containers, Vits and Koenig, merged under the Viko brand in 1909. They are rolling aluminum in Manitowoc to this day. B., the foreigner, is all natural, each tine or tooth carefully fashioned of wood, possibly split bamboo, and bound to the carved grip. It resembles hairholding combs from many cultures, and resides in our collection as a souvenir brought home by an unknown mariner. I welcome any further information. This view of a Bath living room, ca. 1890, shows several chairs with white cloths on their backs, known as anti-macassars. 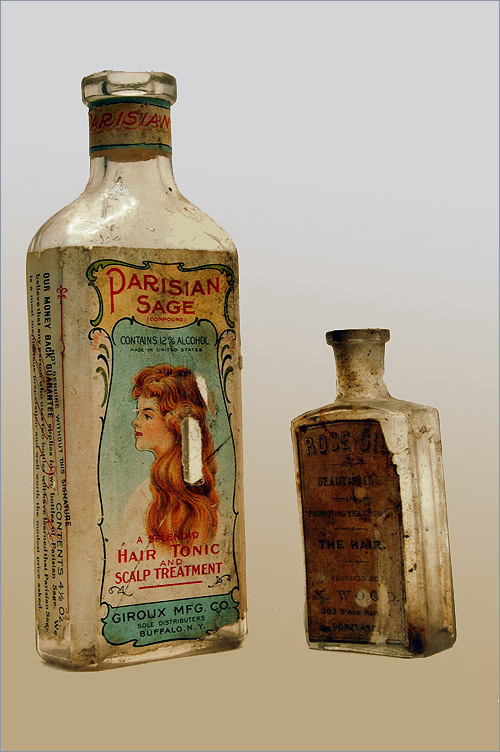 Macassar was one type of hair oil widely used by men in an era that did not require, or indeed know of, the daily shower. 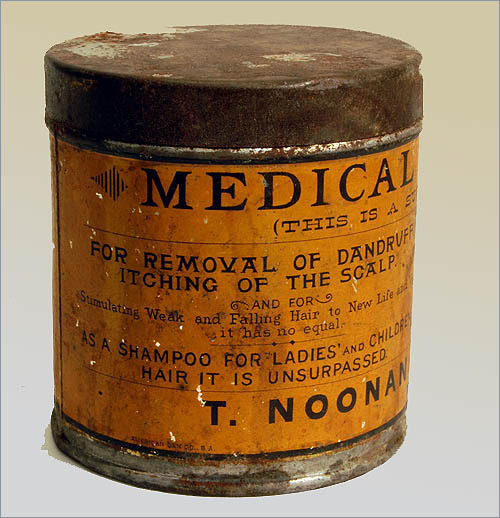 Hair washing was therefore infrequent by modern standards, and the use of pomade and hair oil to enhance control and appearance was widely prevalent. These unguents would invariably blot onto the fabric of chair backs, so the crotcheted and embroidered protective cloths were a common feature in sitting areas. 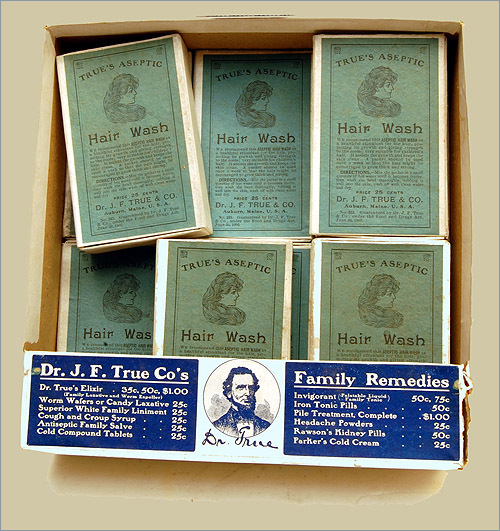 An original countertop display box of Dr. J. F. True’s Aseptic Hair Wash. True’s was an Auburn, Maine concern that appeared to be embracing government regulation of “family remedies”; this hair wash states on the label that it is guaranteed under the Food and Drugs Act, June 30, 1906. That consumers could be marketed to with words like “Aseptic”, reveals the growing popular awareness of germ theory. 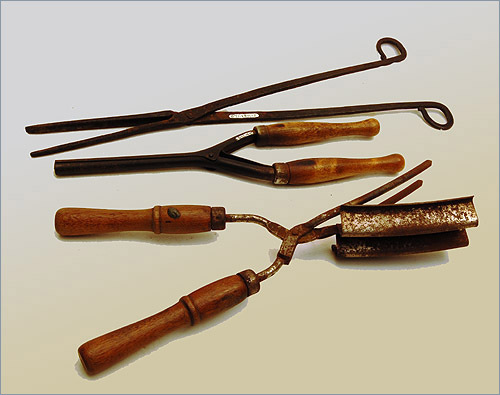 (at top) an early hand forged curling iron; (middle) a spring-closed more store-bought version; (bottom) a waving or crimping tool. All had to be heated repeatedly, whether over a coal stove, or gaslight. Scorch marks can be seen on the handles of the middle iron. 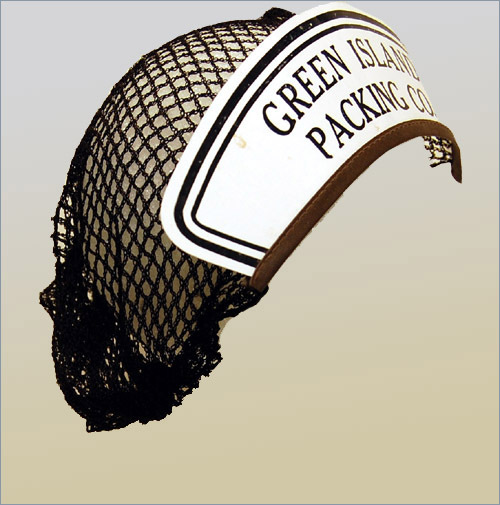 A sardine packer’s hair net from the Green Island Packing Co., Rockland, Maine, which started during WWII with wartime contracts. The first airplane herring spotter was employed by the company in 1949, as was the first open water purse seiner in Maine waters in 1962. Green Island was sold to Port Clyde Packing in 1970. These hair nets were known to have been sealed into a can at the end of a shift along with the sardines, if a foreman was being held in contempt. 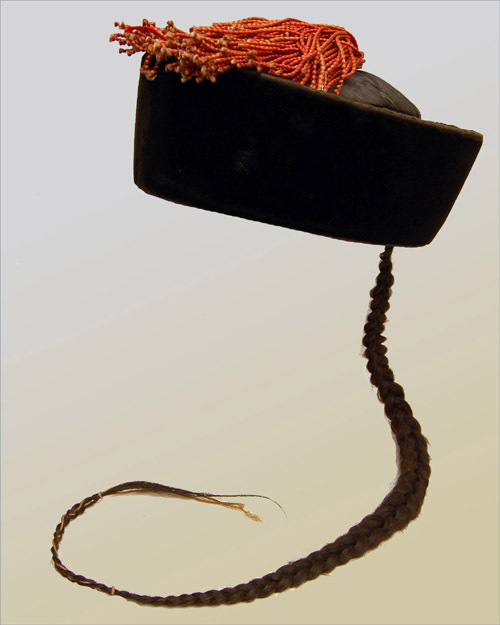 A tasseled black velvet hat with a three foot braided human hair queue attached, brought home from the Orient about 1910. We do not know if this was more than a tourist novelty. Even so, given the historical esteem of long hair in Chinese culture, this is an arresting artifact; its export approaches the unfortunate trade of shrunken heads. 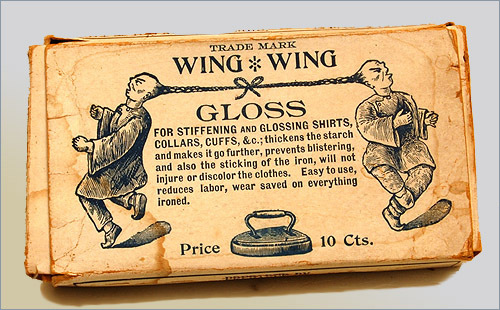 A starch box of about the same year, referencing Chinese laundry services, but also revealing the low status conveyed to immigrant labor. 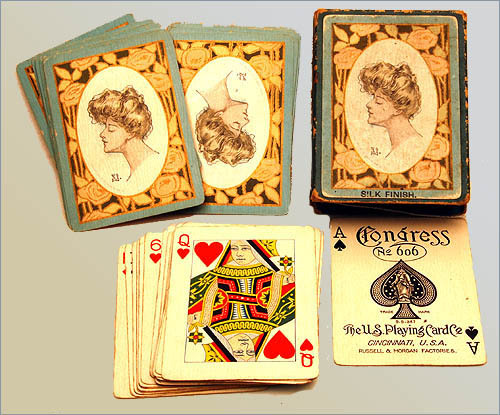 “Silk Finish” (on the box) describes the smooth and slippery quality of these 1900-era playing cards, but is also a dual reference to the ‘Gibson Girl’ big hair portrayed here. The Gibson Girl, with her wasp waist and somewhat but not-too independent, dreamy demeanor, became the pre-WWI notion of idealized beauty. Two ca. 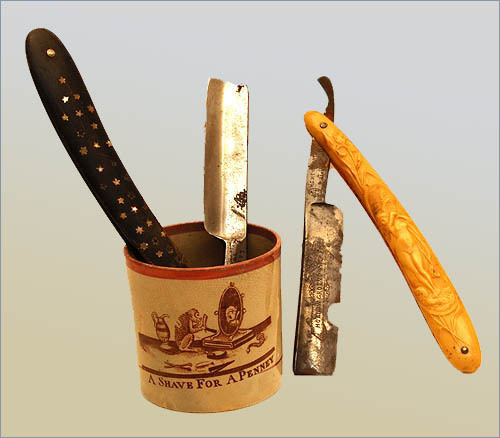 1910 versions of consumer shaving soap sticks, as the safety razor moved the shaving experience from the barber chair to the bathroom. (at left) The Larkin Co. soap and pharmaceutical empire peaked in Buffalo, N.Y. from 1890 -1920. (at right) Colgate, of course, continues in the facial hygiene line. 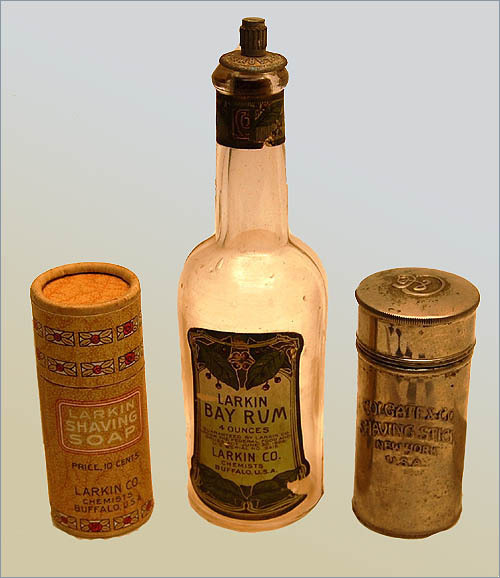 (center) Bay rum is enjoying a modest retro revival as ‘your grandfather’s after-shave’. Well into the safety razor era, we tend to relegate straight razors to bad horror movies and the likes of Sweeney Todd, “the demon barber of Fleet St.” But before the rise of Gillette’s patent in 1903, the care and use of these blades was viewed more prosaically; a good razor was a trusted, intimate, and steadily held acquaintance. (Above) Two nicely detailed versions, one with mother-of-pearl inlaid stars, the other presage-ing the recently introduced Gillette “Venus Embrace” model by a good hundred years. This ca. 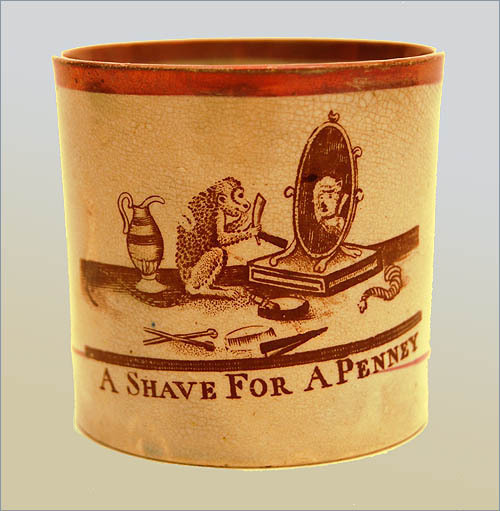 1820 lustreware shaving mug shows a very hairy idea. Never turn a monkey loose with your razors. Even for a penney, you’d do better to keep the beard.